For decades across North America, many biologists and conservationists have been studying bats to find ways to save these unique animals from the many and increasing threats they are facing: threats caused by urbanization, agriculture, renewable energy, human persecution and diseases like white-nose syndrome. In March 2015, 400 conservationists, with representatives from Canada, the US, and Mexico came together in St. Louis, MO for a first-of-its-kind gathering to discuss a coordinated bat conservation effort across North America. As a representative for Canadian bats, in particular those threatened by the fungal disease white-nose syndrome, I attended this important meeting as well. During the three days of the meeting I enjoyed many interesting presentations on the progress that bat researchers have made in their attempt to understand these difficult-to-study mammals. 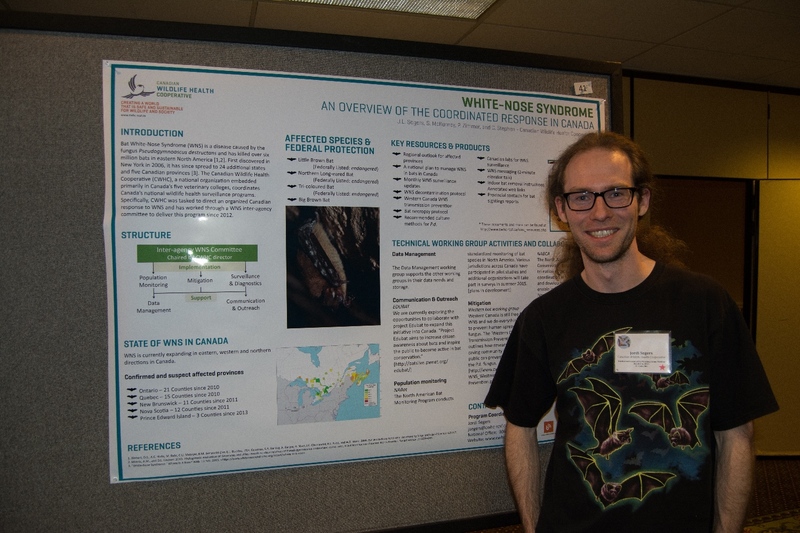 In addition, I spoke with several conservationists about white-nose syndrome and gave a poster presentation highlighting the Canadian response to the disease. These meetings are a lot of fun, particularly because I meet many like-minded people and geek-out with them over our shared excitement for the amazing world of bats that we love and are so passionate about. More importantly, the meeting highlighted our need to ensure that YOU love bats too. A major threat to their survival is the many misconceptions that people have about bats. For centuries bats have been labeled as evil creatures, associated with vampire stories, and this bad reputation resulted in the mere thought of them causing fear and disgust in many of us. Now, more than ever before, it is important to spread the word about how amazing and important bats are to the world and break these false stereotypes. Bats do not fly into people’s hair. They are curious creatures, however, and may fly near you to check you out. Bats do have decent eyesight, but in the dark they use echolocation, advanced natural sonar, to ‘see’ (but more accurately, to hear) their environment, and using this ability, can detect the tiniest of insects. Therefore, bats can definitely ‘see’ you too in the dark. There are no vampire bats in Canada. Mexico, however, is home to vampire bats. They feed on other mammals, mainly livestock, by making a tiny incision and lapping up a little bit of blood each night. The animals being fed on can’t even feel this and don’t generally miss these small amounts of blood. While bats do carry rabies, it is only a small portion of the population that is affected and with a few precautions (e.g., never touching bats with bare hands) the chances of them spreading the rabies virus to humans is slim. Bats have no reason to bite you if you don’t touch them. They know perfectly well that we are not food for them, so unless provoked, they will essentially leave us alone. People do not get white-nose syndrome. This disease, lethal to so many bats, is harmless to us; However, we can carry and transport the spores, so please either stay away from the habitat bats use in the winter (e.g., caves) or ensure you decontaminate after a visit to a cave to minimize the risk of infecting bats elsewhere. Bats are the most important consumers of nighttime insects, including mosquitos and crop pests; thus, they decrease the potential spread of human-insect borne diseases and save us millions of dollars each year in pest control. Tropical species of nectar- and fruit-eating bats are important pollinators and seed dispersers, greatly contributing to forest growth and food resources. Also (and perhaps most important to some! ), there are bat species that pollinate the flowers of the cactus that brings us tequila. These are just a few of many reasons why we should all love and protect bats. Spreading these positive messages about bats is important. The meeting in St. Louis emphasized this, but it is not just us ‘conservationists’ that can do this. YOU can help bats by telling others around you the truth about bats and by attracting bats to your yard by putting up a bat house.